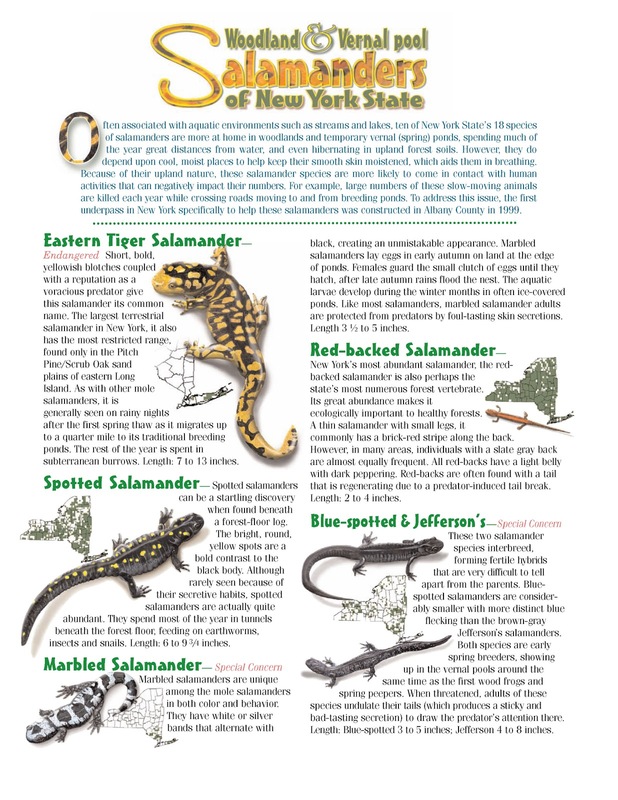 Many thanks to the New York Department of Environmental Conservation (DEC) for this handy guide to New York State's salamander population. 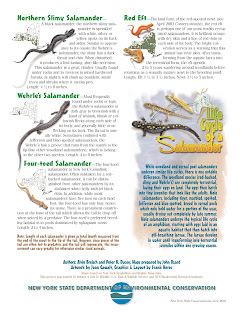 Did you know there are 18 species of salamanders? 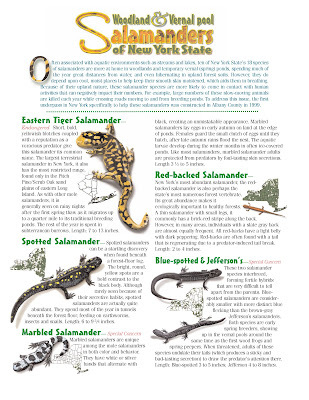 Some of are even endangered list like the Eastern tiger salamander. Others like the Marbled, Blue-spotted and Jefferson's are of "special concern." The life cycle between woodland and spring (vernal) pool salamanders are similar with one very distinct difference. Woodland salamanders are lay their eggs on land and the tiny salamanders look like mini adults. The vernal salamanders breed in seasonal pools of water, which usually dry out by late summer. 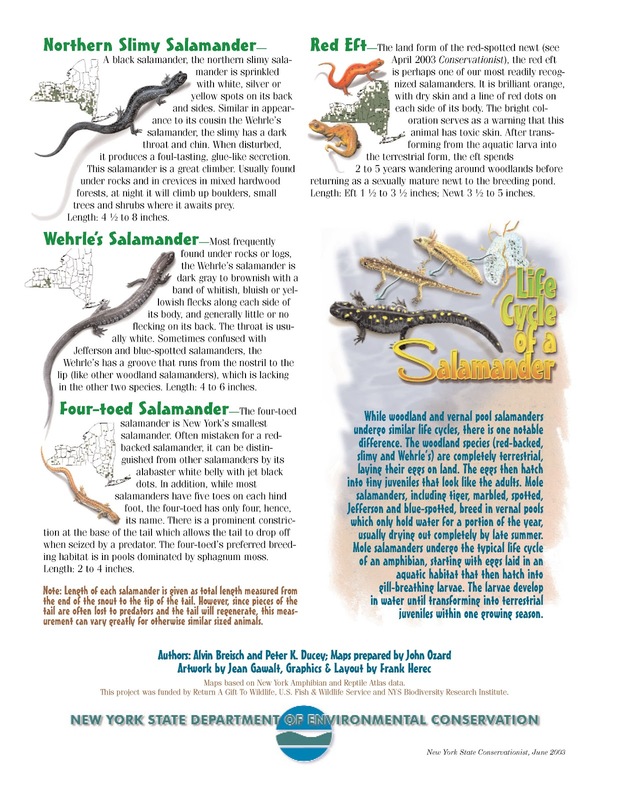 These salamanders undergo the life cycle of a typical amphibian starting with egg, hatching to gill-breathing larvae and becoming land dwelling juveniles in just one season.© Diane Chase is the author of the Adirondack Family Activities™ guidebook series, Adirondack Family Time™, which is available online or bookstores/museums/sporting good stores. 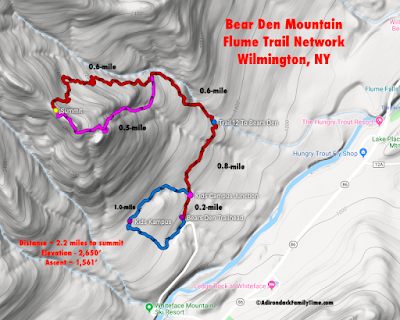 Diane is currently working on the third guidebook in the four-book series of Adirondack Family Activities™.